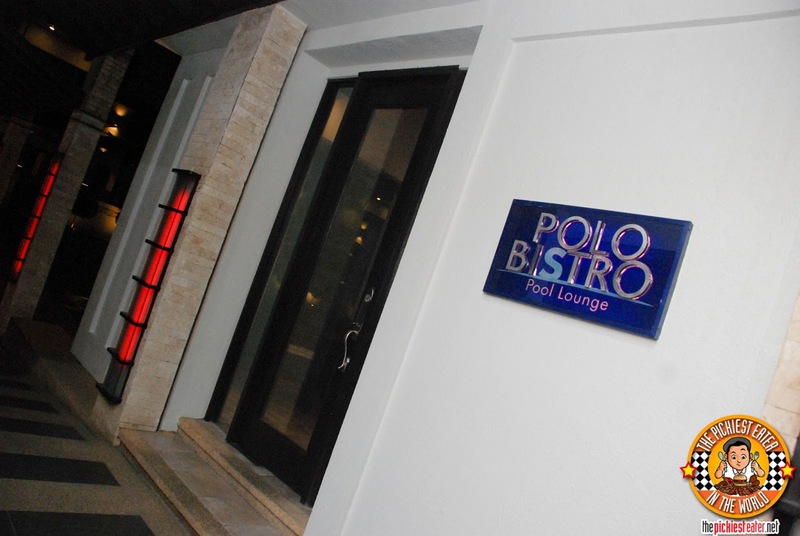 For some strange reason, I initially thought that Polo Bistro was a fine dining restaurant. 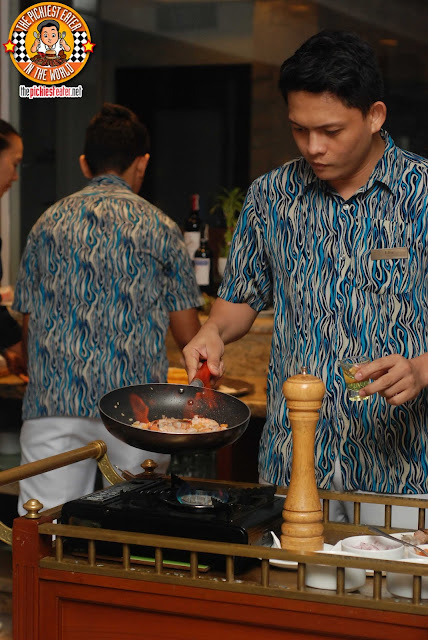 Though the menu may qualify as "Fine Dining", don't let that intimidate you. Polo Bistro is actually a very relaxed lounge by the poolside of the Marco Polo Davao. There isn't very much to say about the design of the place. 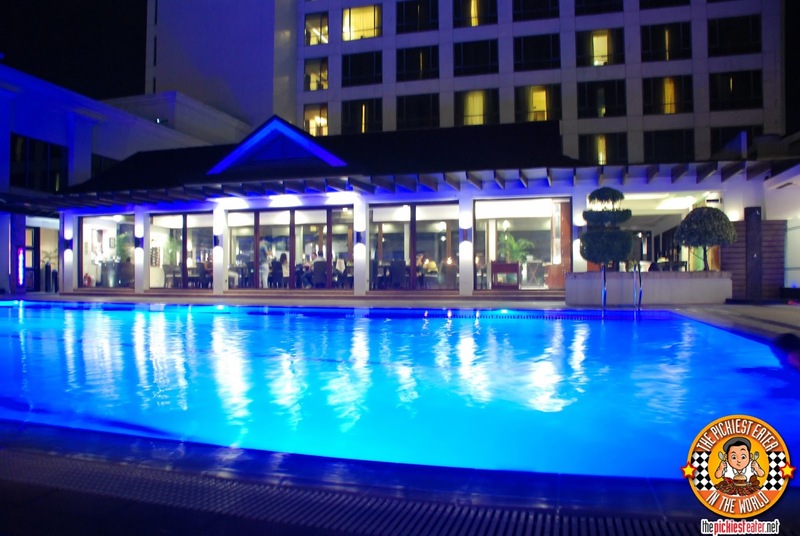 It's basically a simple, but classy dining hall, with glass walls, that give you a glimpse of the gorgeousness of Marco Polo Davao's surroundings.. Their swimming pool and a small courtyard. Don't you love meals that start with free bread? 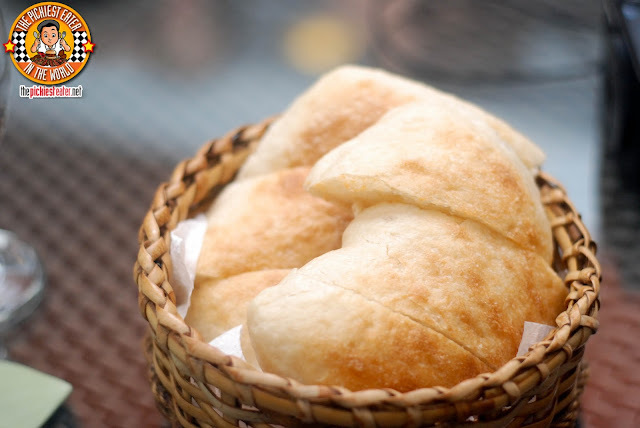 I do, especially if they taste as good as Polo Bistro's Ciabatta. Tear it open, and it's still steaming inside, smear it with some butter, and you can just hear the exterior crunch inside your mouth, just moments before you get to the soft, creamy center. 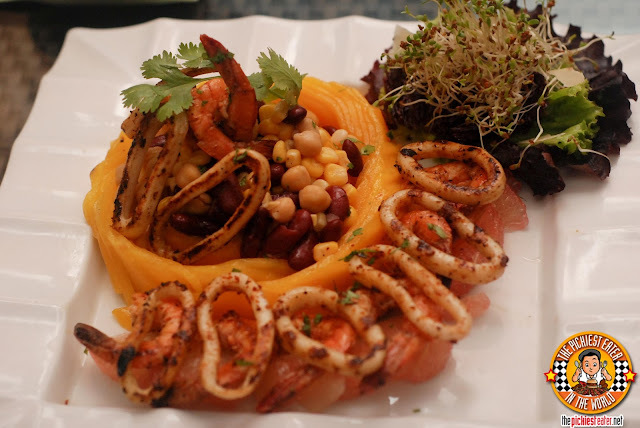 I gotta say, the Three Bean Salad with Cajun Spiced Shrimps, Squid and Pomelo was one of the strangest looking dishes I'd ever seen. But then again, all salads look strange to me. Threre was probably nothing in that plate that I eat, so I decided to play my "Pickiest Eater" card and passed this over to my seatmate when I was done. So, I think we've established that I'm a picky eater right? Which means I don't eat squid.. Unless it's Calamares. Strange? Maybe it's the breading.. I dunno.. 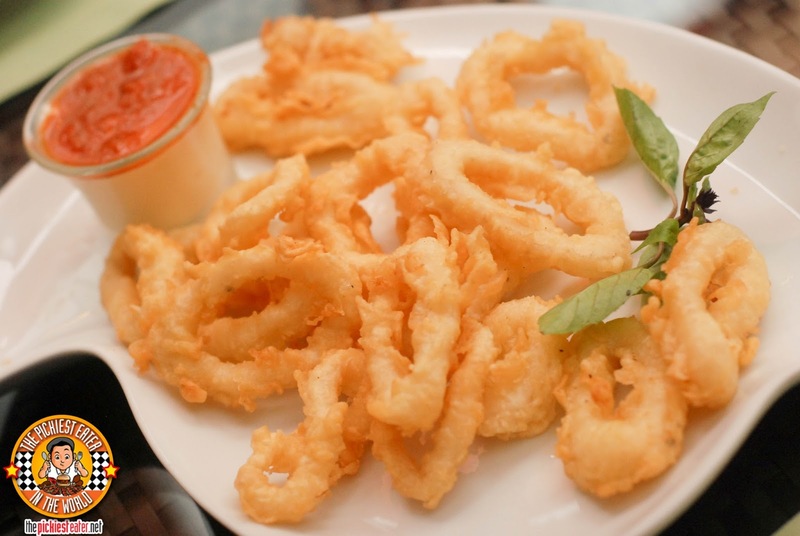 But I had no problems devouring Polo Bistro's Calamares Fritos with Tomato Tartar Sauce. The breading was light, but still enough to let out a little crunch with every bite. I was wary to try the sauce because of the tomato, but I gave my frito a small dip, nonetheless, and enjoyed how the acid of the tomato played off the creaminess of the Tartar. I sometimes do feel bad that Rina, who loves shrimp, doesn't get to eat it as much as she wants to whenever she dines with me. 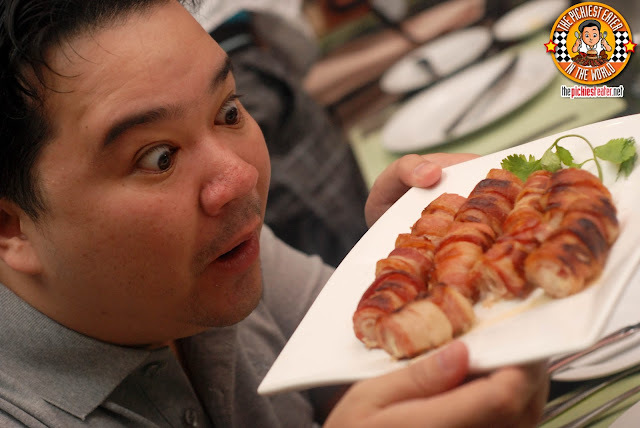 So whenever we go to an event and there's a shrimp dish, I can't help but enjoy watching go nuts over it. 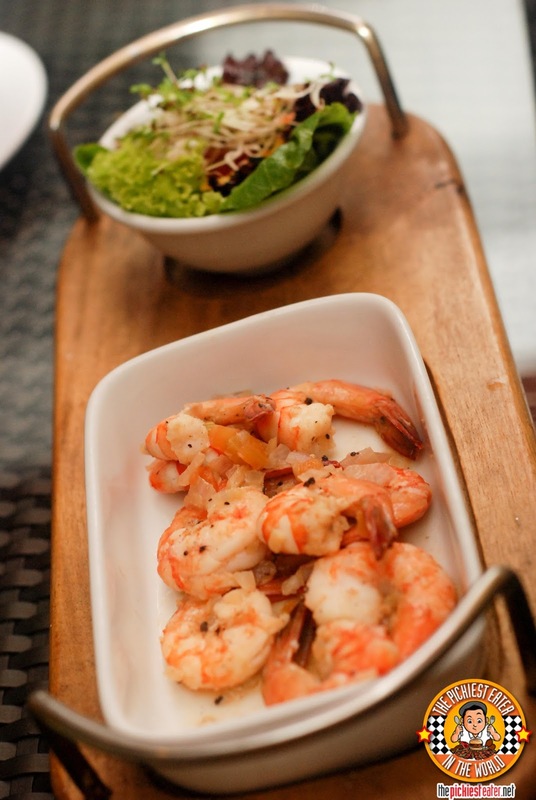 When Rina found out that Polo Bistro would be serving us Garlic and Herbed Shrimps Sambuca with Fresh Salad table side, she nearly lost her mind. (She was so cute, you should've seen her). 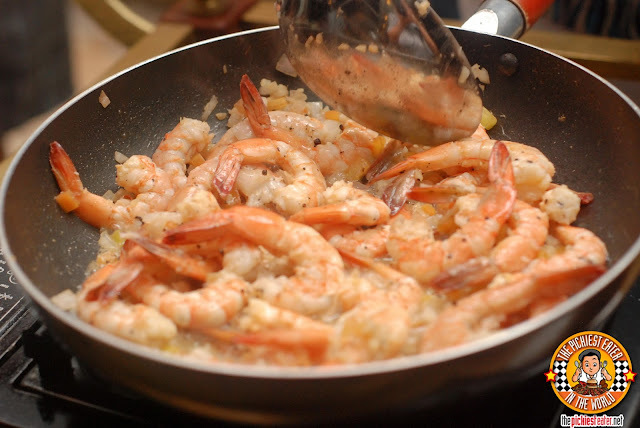 I don't eat shrimp (Unless it's Tempura.. Are you seeing the trend here? ), but even I couldn't deny the buttery, garlicky aroma coming from the frying pan was more than enough to make my tummy grumble (Rina swore she thought she heard a Grizzly Bear). Because of my giving nature, I decided to forego my share, and give it to Rina instead. That's just the kind of guy I am. I'm not sure how it tastes, but Rina couldn't get enough of it. I noticed that no matter where you go, Mozzarella sticks tastes nearly the same. The difference may be in how heavy or light your coating is, but on the whole, one isn't very much different from the other. 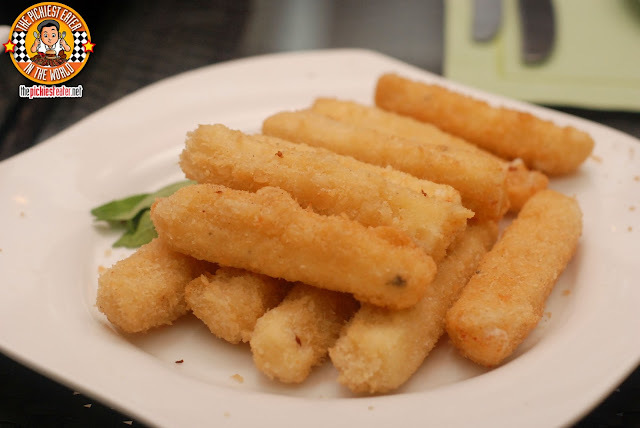 Not that i'm saying Polo Bistro's Fried Mozzarella Cheese Sticks with Marinara Sauce wasn't delicious, but it just wasn't very much different from the other similar dishes that I've tried. If you read my earlier post on Cafe Marco, then you would know that Marco Polo does wonderful things with their bacon.. Something that they proved with their Bacon Wrapped Chicken Fillets with Chive Cream Cheese and Mango Relish. 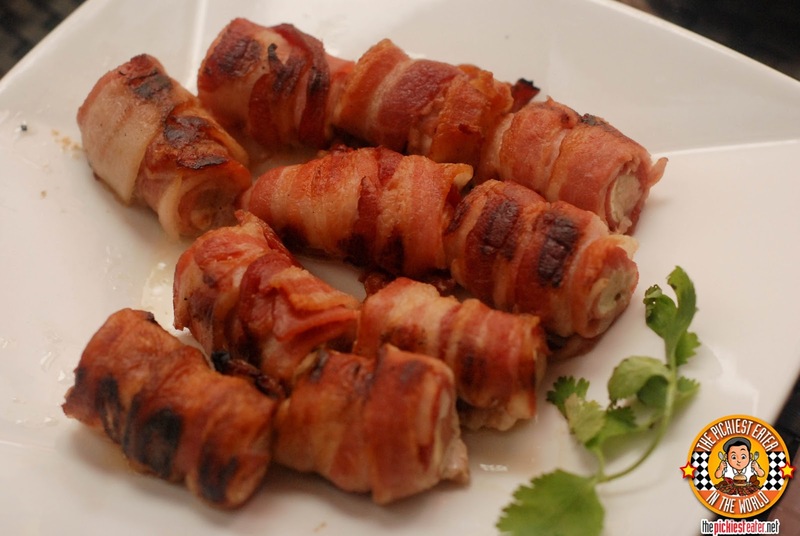 Glorious strips of bacon wrapped around a juicy chicken fillet, stuffed with chive cream, and ready to be dipped into the lightly sweet mango salsa. Yes, it was absolutely as good as it sounds. 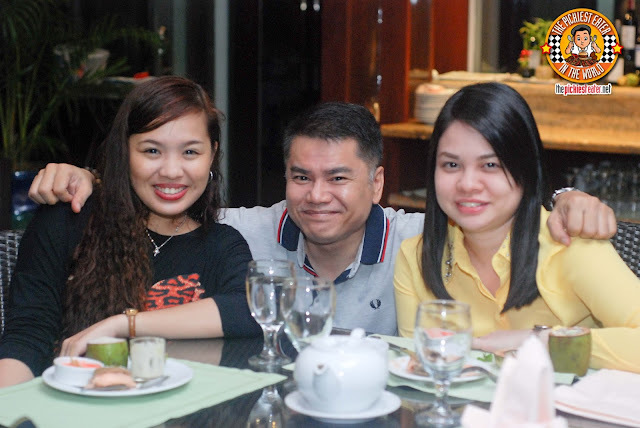 Had I had a cup of rice with me at that moment, I would have been fine with this as my main course. Gawd dang those were good. 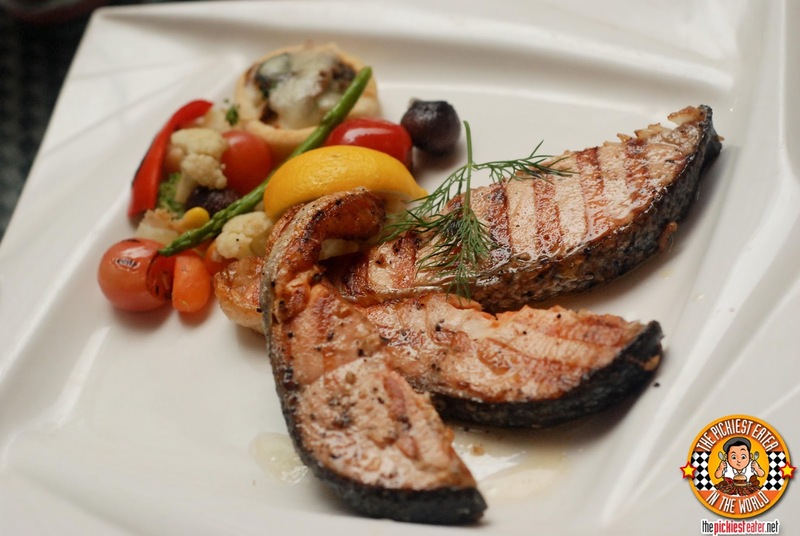 If you're looking for a lower calorie meal but is just as filling as pork or beef, you could try the Atlantic Salmon Steak. Lean, yet tasty Salmon covered with stunning char marks across the meat, served with buttered vegetables and a choice of rice or mashed potatoes. Something that called out to me like it was my long lost relative, was the Baby Back Pork Ribs. 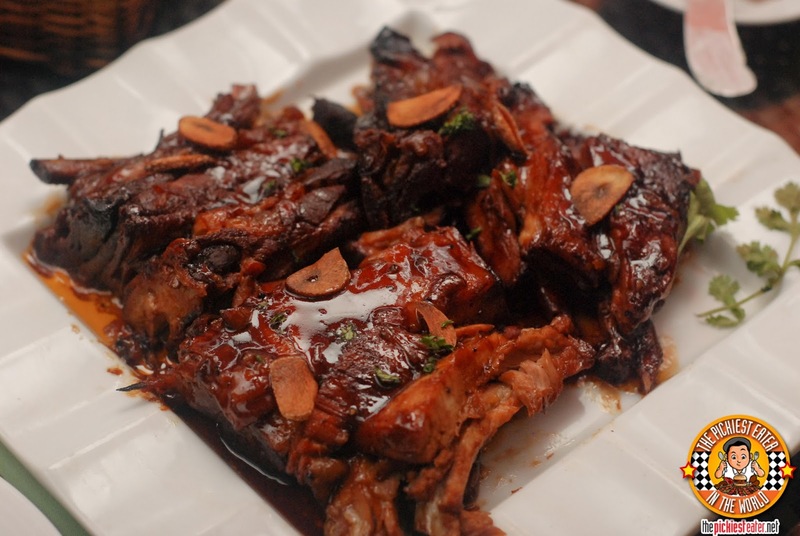 You could tear the Barbeque sauce glazed meat off with a simple flick of your fork, watch it rip cleanly off the bone. For the Coup De Grace, Polo Bistro brought out the U.S. Angus Prime Ribeye for us. At first glance, the steak, especially the exterior, looked a tad dry, but the meat itself, was cooked to a nice medium to medium rare. 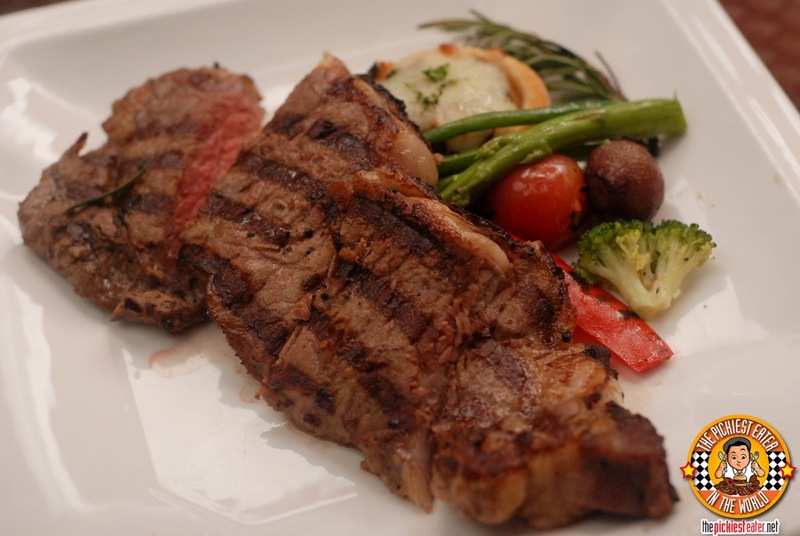 The steak was juicy and tender, and was seasoned perfectly, with the natural flavor of the beef taking your taste buds for a whirl. The Ribeye remains my favorite cut of steak, predominantly because of the presence of fat, and Polo Bistro's Ribeye Steak reaffirmed that. To end our meal, Polo Bistro showed us some of the creations their talented staff made, infusing classic desserts with an undeniable Pinoy twist. 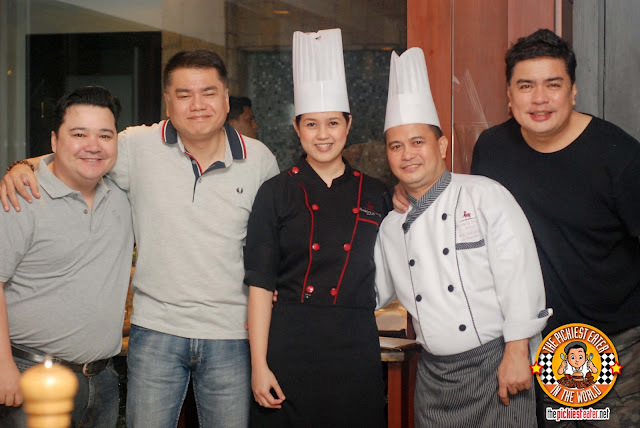 It wasn't long ago that Rina, Baby Rain and I, enjoyed a Staycation at F1 Hotel Manila, where we were treated to the culinary wonders of Chef Sau Del Rosario's "Flavors of LuzViMinda" food festival. 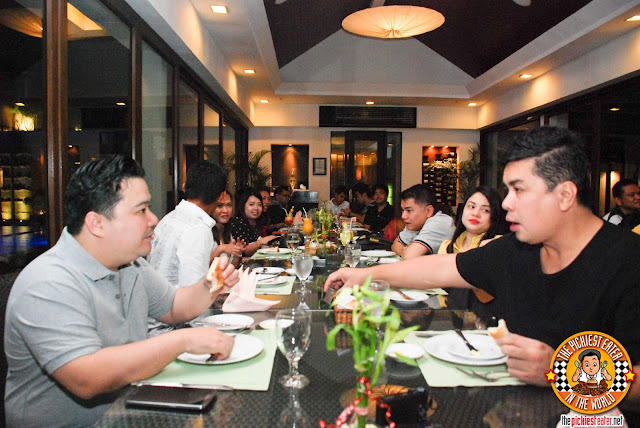 Representing the Mindanao region, was none other than Chef Ed Tuazon, the Executive Chef of Marco Polo Hotel Davao, where he and his team unveiled the Durian Pana Cotta. 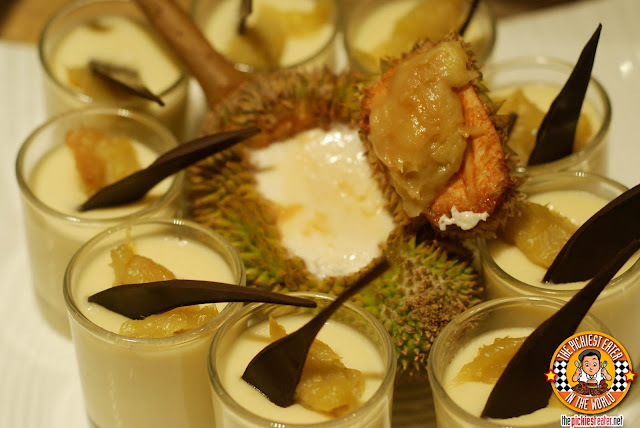 The pungent flavor of Durian worked well with the creamy Pana Cotta, helping temper the taste that many, including myself, are not a huge fan of. For those who love Panna Cotta but have a strictly "No Durian" policy, Polo Bistro also offers yet another play on the dessert classic, this time in the form of their Coconut Panna Cotta. 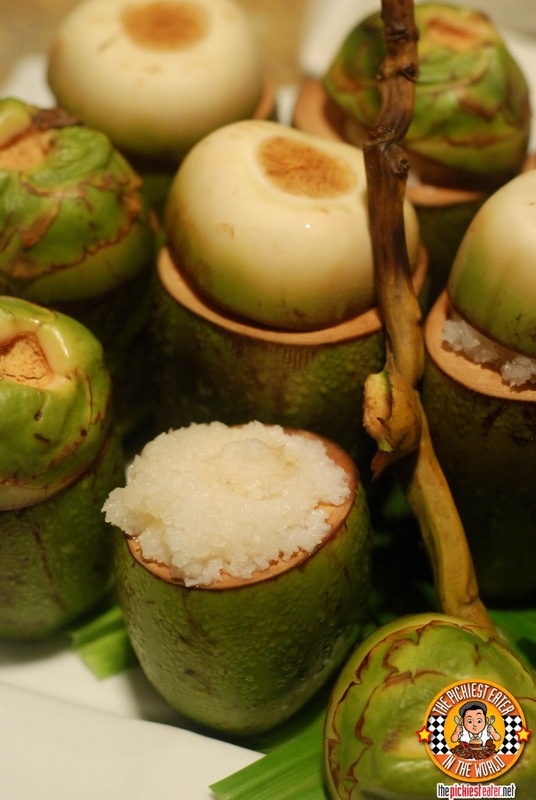 Young Coconuts are cracked open and filled with pana cotta, then topped off with shredded coconut meat. A fruit that I noticed that doesn't get the same press as the Durian, but seems to always be a request whenever someone is coming back from Davao, is the Pomelo. 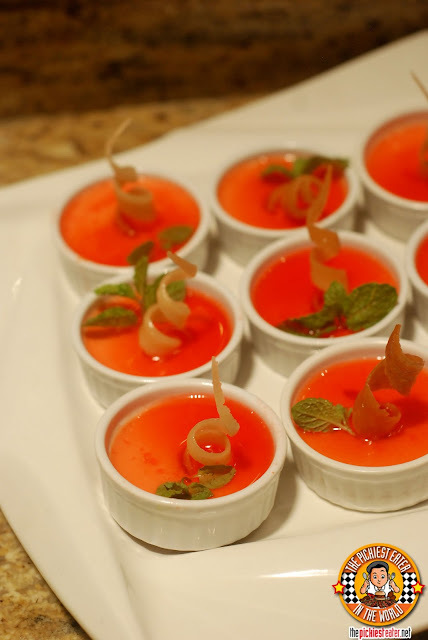 Polo Bistro took that Davao staple, and turned it into a delicious Pomelo Flan. I've always found the pomelo to be a rather complex fruit.. It can be Sweet, bitter, sour, or all three at the same time. The milky creaminess of the flan balanced that out perfectly. 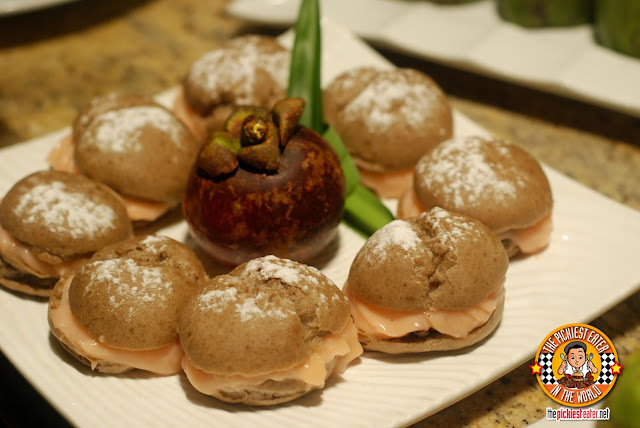 The popularity of the French Macaron has reached new heights in the past couple of years, and Polo Bistro capitalized on that by creating their own version.. But using another fruit popular in Davao. 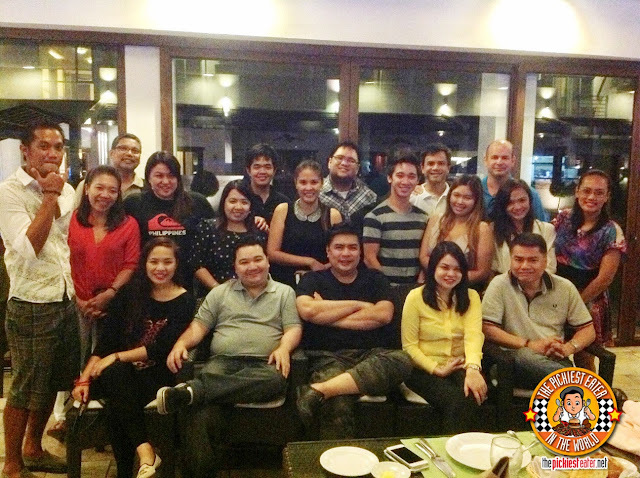 Marco Polo Davao arranged a wonderful evening of phenomenal food and great company, by inviting some fellow bloggers from Davao for us Manila based ones to meet. 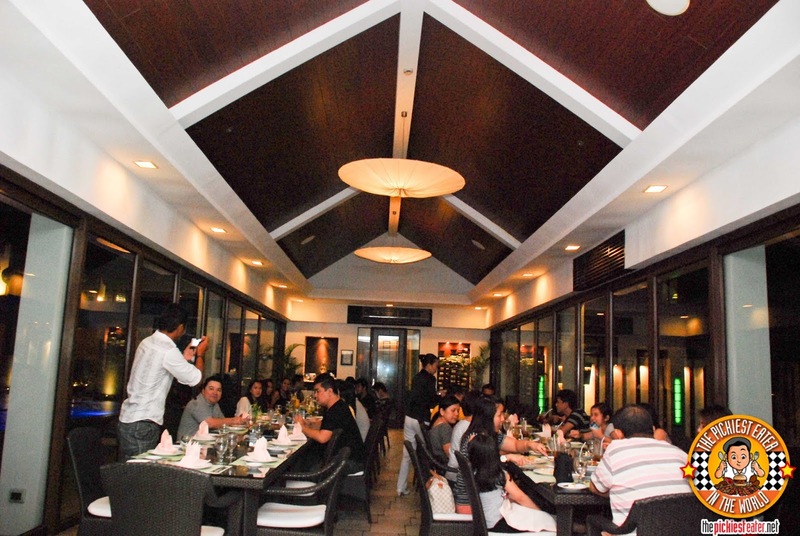 If you're looking for a restaurant in Davao with a great ambiance and mouthwatering food that would impress your date, Polo Bistro should definitely be on that list. By the way, you guys so everything I ate, so please don't mind what seems to be an overly tight fitting shirt on me. He gave that last piece to me. We were happy to be reunited with Chef Pauline, but again, The Dude4Food seems to be taking that happiness to whole other level. 4th Floor aka "The Deck"
Hugh Jackman of the Philippines!